We arrived safe and sound around noon after a most pleasant flight Wednesday morning. We both managed to get aisle seats and had empty seats beside us too, so we had lots of room and were more than comfy for the five hour flight. The drive in from the airport was filled with oohs and aahs over the vegetation. The huge flowering bushes and massive trees astounded me. Some hedges were taller than the houses and entrance ways were cut in them to allow access to the front door. The camera was in the trunk so I didn’t get any pics, but will try on our next drive through town. We found the girls apartment without any trouble and a perfect parking spot was nabbed about a block away. 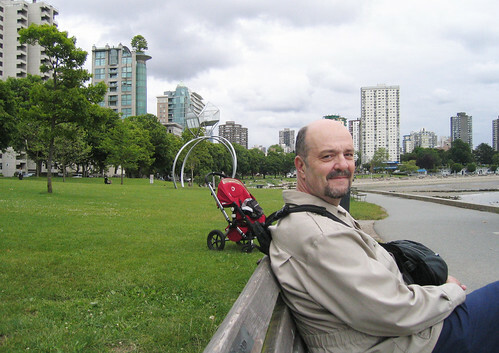 Our first stop was a Starbucks for a large coffee and then we walked across the street from the coffee shop to Stanley Park. Yes, the girls are only two minutes away from the entrance to the park. As you can see from the first picture, this sign marks the entrance to the park, and the girls apt building is the tallest one on the right. 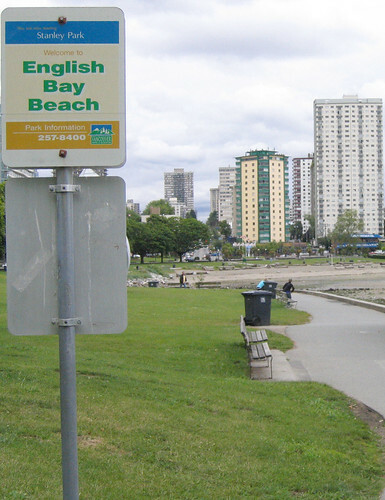 We sauntered along this path and stopped now and again at one of the many benches along the way to relax and enjoy the view of English Bay. You can see the girl’s building just to the right of AC’s head, but I mainly took this pic to show you the building with the tree on the roof. You might not be able to tell from this pic, but it is a huge tree! It was low tide when we were walking along, so lots of the ocean floor was exposed. I noticed some markings on one of the rocks that would be under the water at high tide, so moved in to get a closer look. I was quite surprised to find that the ocean hadn’t make those markings, but an adventurous artist had. This pic gives you an idea of the walking path along the water and the size of the jumble of rocks where I found the paintings. I could have easily missed them. Once the girls got home, we shared hugs all around the then went out for dinner at a charming cafe with a marvelous view of the ocean. 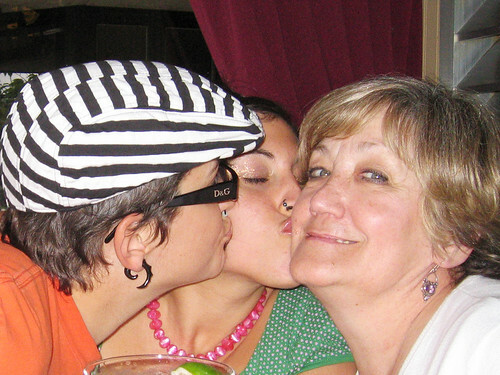 More love was spread around while we waited for our drinks to arrive. 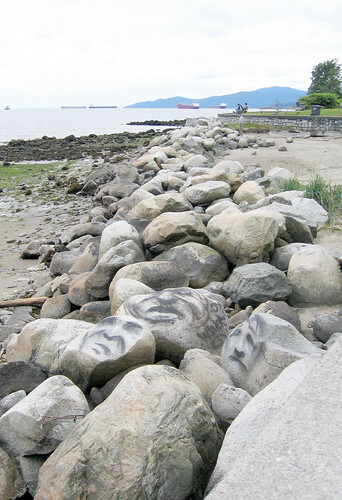 After dinner we walked along the beach in the other direction from Stanley Park and decided to join the Inukshuk, and help him give directions to fellow travelers. It was a marvelously, glorious, wonderful, fabulous day! Total fun. I am still trying to adjust to the time change, but should have my clock turned around in a day or so. Yesterday we did a walking tour of this area, and I think AC is posting some pics of that adventure. Must run now and get ready to face this day. 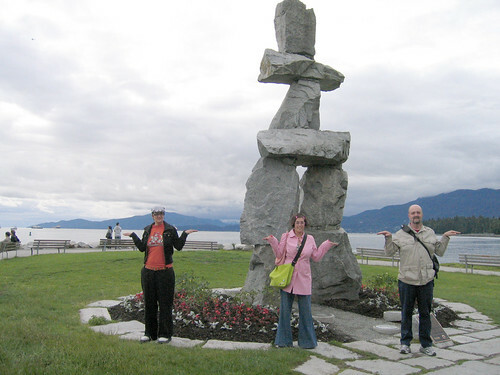 Hope you find Inukshuks to point you in the right direction all along your path of life today. Enjoy the journey wherever it takes you. Yoe are a wonderful tour guide, love the photos and commentary. 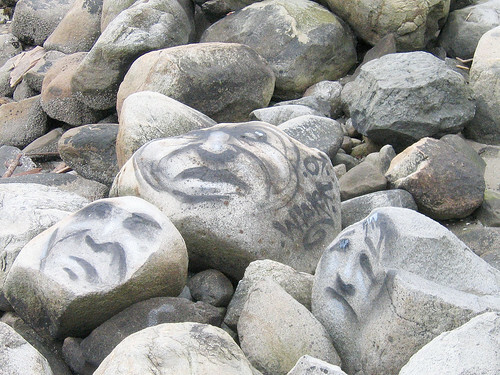 And, of course, was quite taken with the faces on the rocks. Love the photos and must admit to feeling very envious. The west coast is one of my favourite places in Canada. I am lucky to have a sister who lives in Victoria so I do get a chance to visit every couple of years. Like you I am always blown away by the amazingly tall trees and the lush greenery. I am so looking forward to more pictures. Have a great time. How wonderful that you are taking us along on your trip. Have the time of your lives. Yesterday I only saw one picture but today they are all there. The tree looks amazing and I just love the faces on the rocks. I just caught up with you as my computer was down. Glad you are enjoying LA LA Land. Your pictures are superb.